The bigger you are, the bigger the bite of your appetite – or at least, that’s the case for Greenland sharks. A new study by Julius Nielsen and his team of co-authors looked at what different size Greenland sharks are eating, and their results show that these sharks change their dietary preferences – and their place in the food chain – at some point in their life. Their publication was part of the Greenland shark project ‘Old and Cold – Biology of the Greenland shark’ which was financially supported by Save Our Seas Foundation. While small (and consequently, younger) Greenland sharks eat a squid-rich diet, larger (and older) Greenland sharks target fish and seals. This finding is surprising because these slow-moving sharks might have been thought to be scavengers. What Julius and his team have shown is that these old, cold, slow-moving sharks are likely capable of hunting faster-moving prey. Greenland sharks have made news headlines as very long-lived sharks (they can reach the stately age of at least 272 years, as radiocarbon-dating showed in this paper published in Nature. They are highly migratory, found across the Arctic and in the cold waters of the Atlantic. In fact, the size distribution of these sharks seems to vary from place to place: smaller sharks (less than 400 cm in length) are common in the Canadian Arctic, northern Greenland and Norway’s Svalbard Archipelago. Larger sharks (greater than 400 cm in length) are more often sighted in southern Greenland, Iceland and Newfoundland. These are all typically deep-dwelling sharks, with one record at 2992 m (9816 feet) below the sea’s surface, near the mid-Atlantic ridge! 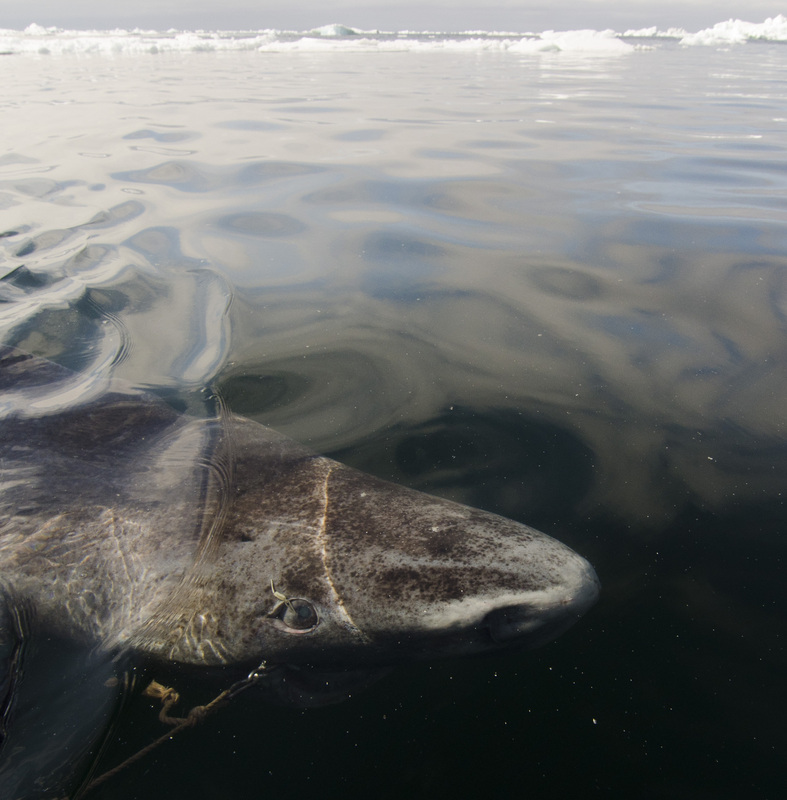 Julius and his team of co-authors showed in a 2014 study that in Greenland’s waters, these sharks are typically living between 400 – 700 m (1312 – 2297 feet) depth. The Greenland shark is listed as Near Threatened on the IUCN Red List of Threatened Species, its tendency to grow slowly and reach a ripe old age making it a shark worth keeping conservation tabs on so that we can adequately manage its populations. The size of a shark can be related to its age, and as Julius reports from this study, it seems that Greenland sharks larger than 400 cm were mature females. This suggests that male sharks are mature at 300 cm, and females at 400 cm in length. The researchers searched the stomach contents of 88 sharks and analysed the stable isotope values from the sharks’ white muscle tissue to understand the relative importance of different prey in their diets. Stable isotope analysis measures the ratio of different isotopes (atoms of a certain element, with an equal number of protons and an unequal number of neutrons) in the body tissues, where it’s possible to understand what kind of diet that organism ate throughout its life. You might find this explanation of isotopes, their analysis and the application to ecology here rather handy. Greenland sharks seem to shift their diet from squid when they’re around 200 cm in length, to a diet rich in fish and mammals as they grow older and larger. In fact, mammals became increasingly important to the menu as Greenland sharks aged and increased in length. So what’s on the menu for Greenland sharks? Armhook squid was by far the most important for the smallest sharks, with some unusual finds including marine sea spiders and shrimp making it onto the list. For larger sharks, harp seals, Atlantic cod, skates, Greenland halibut, lumpfish, wolffish and redfish were all on the menu. Some unique finds included a sleeper shark and polar bear! The relative importance of various fish species differed between shark size groups, where redfish were only important to sharks over 400 cm in length. This kind of information helps scientists understand if sharks of different ages and sexes are selective in what they eat, and where (at what depth and in which region) they might be feeding. For instance, large female Greenland sharks are thought to spend more time on the continental shelf and in the upper part of the continental slope than in waters deeper than 800 m (2625 feet). This study found that really deep-dwelling fish prey, like Greenland halibut, grenadiers and slickheads, were absent from the stomachs of these sharks – further evidence to support the depth records from the tagging study. These findings are significant because as the authors of this paper write: “For decades, scientists have noted the discrepancy between the lethargic appearance of the Greenland shark and the potentially faster moving prey species found in their stomachs”. This study shows that Greenland sharks are capable of actively preying on faster prey such as seals, Atlantic cod and Greenland halibut. How on earth they do this, is a question that remains to be answered! One suggestion is that these sharks prey on seals snoozing in the water column. 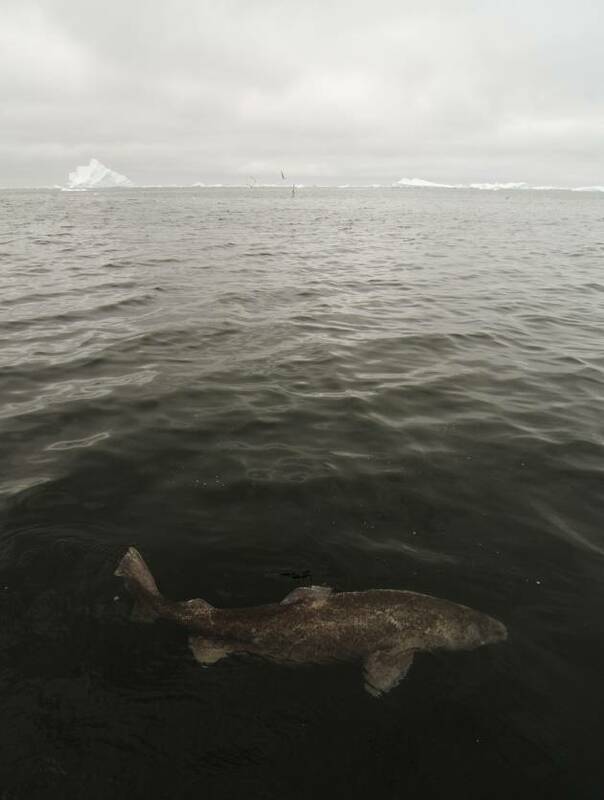 It seems young Greenland sharks are specialising and specific in their dietary preferences (something that probably resonates with those of us who were fussy eaters as kids! ), whereas older Greenland sharks are generalists. All of this contributes to our better understanding of how shark lives its life, where it might fit in the ecosystem and how this might change throughout its very, very long life. **Reference: Nielsen, J., Christiansen, J.S., Grønkjær, P., Bushnell, P.G., Steffensen, J.F., Kiilerich, H.O., Præbel, K. and Hedeholm, R.B., 2019. Greenland shark (Somniosus microcephalus) stomach contents and stable isotope values reveal an ontogenetic dietary shift. Frontiers in Marine Science, 6, p.125.